If you noticed last week, there is now a whiteboard next to where the punch in/out machine is outside of the office. This is an effort to try and make it as convenient for you as possible to update myself and staff with any school events that are happening for the month, in case we missed it VIA EMAIL. It is also a way to book a school editor, radio reporter, or photographer for one of your trips if you would choose to. Write it: Literally write on the board the event you're having. Follow my example, it's the first written in event. All events should be approved by Ron, so use this wall after approval. 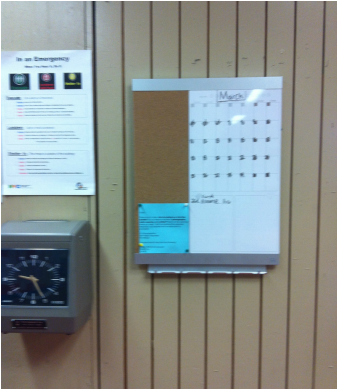 This wall is more of a request for a student group to cover your event or as an informative wall for the staff. No Space Use the paper and pins: If there is no space then simply write your event on the post it with the request in advanced. The Teacher's Choice Program provides an opportunity for teachers to purchase instructional materials and supplies for use in their classrooms. The second round of Teacher’s Choice funds will be distributed this week. Participants enrolled in direct deposit should have received their allocation on February 25; participants who are not enrolled in direct deposit will receive a debit card with their paycheck on February 28. This distribution is intended to provide funds to participants who were reported as being mistakenly excluded in the initial distribution of funds in December; to be included in this distribution, notification was due to the Teacher’s Choice Program office on February 1. The third, and final, distribution of Teacher’s Choice funds for eligible staff who have not been included thus far will occur at the end of May. If you identify any staff members who were mistakenly excluded from earlier distributions, you should email specialprojects@schools.nyc.gov by April 3. For additional information or assistance, contact the Teacher’s Choice Program at specialprojects@schools.nyc.gov or 718-935-3304.